"Just walk up and say hello," my friend Dana said. "No, he's busy," I said. "I don't want to bother him." "Come on, you know you want your picture taken with him." "Yes I do, but not now." I was not. Shy would've been getting the nerve to ask Robert Iger out on a date. Since the president and CEO of the Walt Disney Company isn't really my type, that wasn't an issue. Saying hello is a fairly simple process. 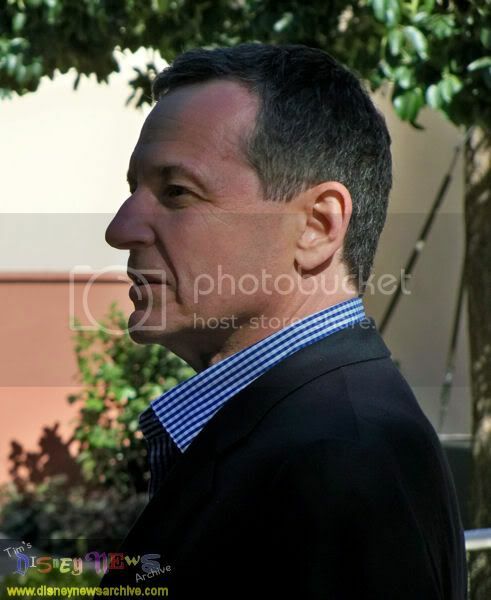 I could see, however, that he was busy talking business to some people outside the Walt Disney Studios Theater, just minutes away from introducing chief archivist Dave Smith to an audience ready to celebrate 40 years of the Walt Disney Archives. Now was not the time. I was sure I'd be able to see him at the reception after the event. I'm very polite when I stalk well-known people. Dave Smith has been running the show at the Archives for its entire existence. In the late 1960s, when he was a reference librarian at UCLA, he completed an extensive bibliography on Walt Disney and was later asked by the studio to help devise a system of organizing and archiving Walt's many letters, awards and memorabilia. So, Dave took a hiatus from his university work...and never returned. Forty years later, he's made the Walt Disney Archives the gold standard for animation and pop culture preservation. Although the event last Friday wasn't meant to be a farewell party--Dave isn't retiring until October--it certainly felt like one, especially when Archives manager Becky Cline fought back tears as she paid tribute to Dave and his incredible legacy at Disney. Becky will succeed Dave as chief archivist, and it's a well-deserved promotion. She's spent more than twenty years with Disney, most of them at the Archives. As a child, she grew up near Burbank and was a regular visitor to Disneyland. "Mary Poppins" was the first movie she ever saw. By her own admission, she has the best job in the world. She can stay. She's one of us. Other VIP's in attendance included film critic and historian Leonard Maltin, who did a Q&A with Dave (I have to name drop here. I found out a few weeks ago that Mr. Maltin follows me on Twitter. As an admirer of his work--his book "The Disney Films" is one of the reasons I've been a lifelong Disney fan--I'm genuinely flattered). Also showing up was Karen Dotrice (little Jane Banks in "Mary Poppins") who donated her jacket from the "I Love to Laugh" scene to the Archives. A parade of Disney execs also we're on hand to donate items. 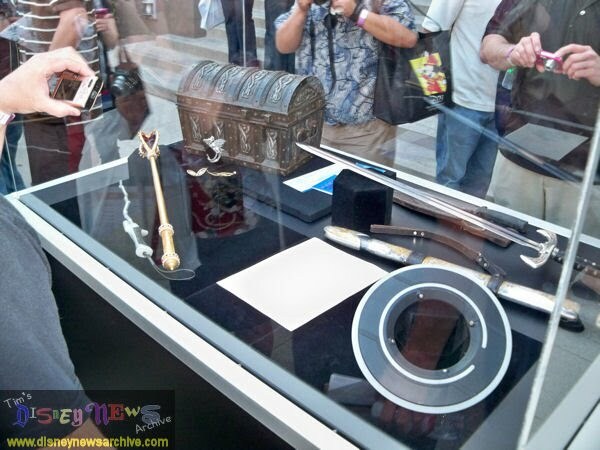 Before the evening was over, the Archives added to its collection the Red Queen's scepter from Tim Burton's "Alice in Wonderland," the Dead Man's Chest from "POTC 2 & 3," John Locke's knife and an Oceanic boarding pass from "Lost," Nicolas Cage's dragon ring from this summer's "Sorcerer's Apprentice," a lighted disc from the upcoming "Tron Legacy," a wand from "The Wizards of Waverly Place" and a jacket worn by Joe Jonas. Consider for a moment the range of items represented here. Now add memorabilia from 11 theme parks and a wealth of animation and film items accumulated during Walt's lifetime, and you have just a small idea of the breadth of the Archives collections. It's truly staggering. After the presentation, we were treated to cake and champagne outside the theater. It was also time to troll the crowd for some more Disney celebs. When you're a Disney geek, your idea of celebrity is different from normal people. Others may go gaga for, well, Lady Gaga or Angelina Jolie or Brad Pitt. More conventional Disney fans may be impressed with Miley Cyrus or the JoBros. I'm gobsmacked by the likes of Tony Baxter, X Atencio and Bob Gurr (and if I have to explain to you who these people are, be gone with you). It was with great satisfaction, then, that I spotted next to the champagne table none other than Disney composer (and legend) Richard Sherman. With his brother Robert, Richard Sherman composed his fair share of the Great American Songbook while at Disney. The Sherman Brothers wrote the music for "Mary Poppins," "The Happiest Millionaire," "The Jungle Book," "The Aristocats" and "Bedknobs and Broomsticks," among many others. 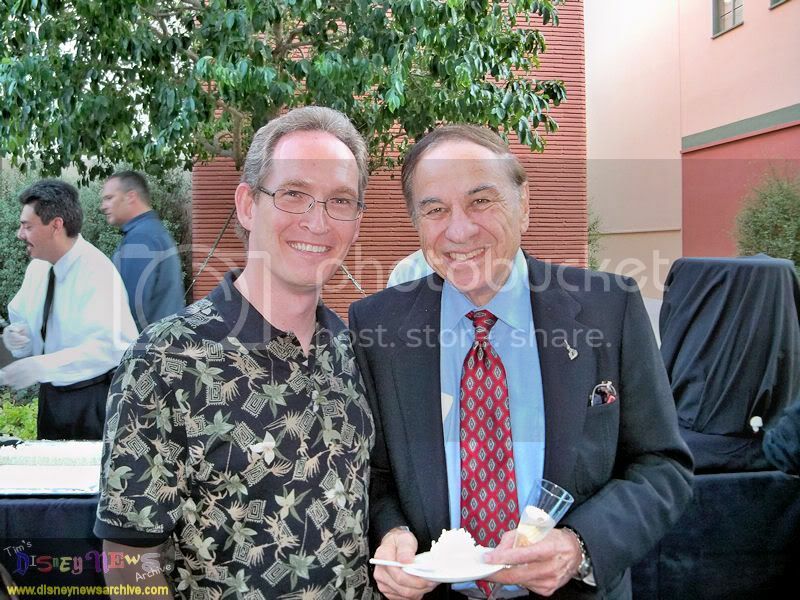 I had seen Richard perform a few songs at a screening of the documentary "The Boys: The Sherman Brothers" at the D23 Expo last year, but it was a treat to finally meet him in person. 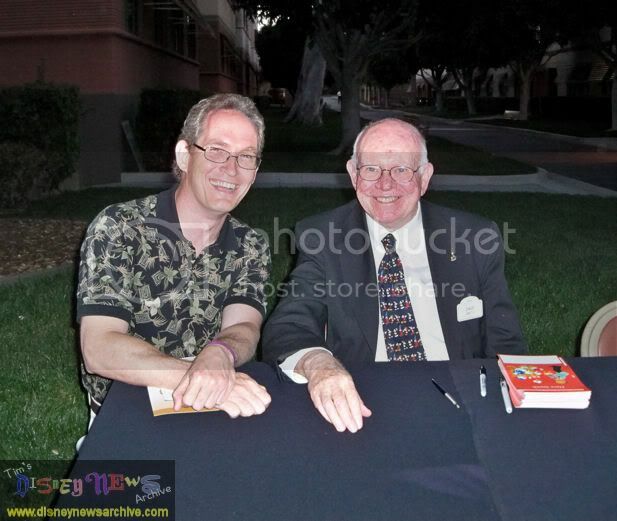 The evening was ultimately about Dave Smith, though, and in anticipation of the many well-wishers at the event, a table was set up at the end of the sidewalk for a meet-and-greet with the man himself. Dave chatted with the steady stream of attendees, posing for pictures and signing autographs. I'm sure by the end of the evening, he was tired of hearing all the praise being heaped on him, but he accepted it humbly and with class. And what about Bob Iger? Ummm, well, he left early. I didn't see him at the reception. Next time, I'll be more rude.